1995 Ford Mustang Cobra SVT For Sale in Ness City, Kansas 67560 This 1995 Ford Mustang Cobra SVT is in excellent condition inside and out. This Mustang has been meticulously maintained, has never been smoked in and has always been garage kept. This car has a gorgeous orange and black exterior complimented with black interior that will surely turn heads. This Cobra SVT has a 5.0L 8 Cylinder engine paired with a 5 speed manual transmission. 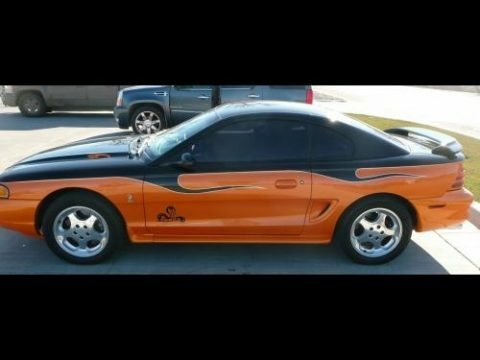 This Ford Mustang has many great features including: AM/FM Radio CD Player Power Windows Power Locks Power Steering Power Brakes Cruise Control ABS Tilt Wheel Tinted Windows AC Air Bags Alloy Wheels Disc Brakes Good tires This 1995 Ford Mustang Cobra is a must see and drive. Don’t miss out on this great opportunity to own this great car. Call (844) 814-9388 for more information.